This weekend more than ever it feels like Nebraska winning the football game really played into the perception of what is happening in recruiting. A win signals the sky has not completely fallen and a loss means it’s time to blow things up. Nebraska took Rutgers down 27-17 on Saturday and made plenty of waves with recruiting as well. Nebraska had a pair of official visitors on campus in 4-star defensive back Christian Tutt‍ and 4-star defensive end/outside linebacker and Oklahoma commit Jalen Redmond‍. Tutt had previously been to campus for the Friday Night Lights camp in June and also worked with the coaches at Nebraska's satellite camp in Georgia. The trip was about two things: Tutt being able to experience a Husker game day, and his parents seeing why he thought so highly of the coaches and school. In my talks with him Sunday, he called the trip a “real eye opener” for his parents, which is a great development for Nebraska. I have long had a prediction in for Tutt to end up at Nebraska and nothing that happened this weekend changed that feeling. Redmond was a surprise visitor this weekend. The Oklahoma native and Oklahoma commit had long been towards the top of Nebraska’s outside linebacker wish list and Trent Bray has worked very hard to get Nebraska in position to be a factor here. I am still working on reaching Redmond who arrived in Lincoln on Saturday with his mother for the game. However, I do know that this trip was important for Redmond’s mom to see why he was so interested in Nebraska. Nebraska would obviously love to flip Redmond’s commitment and steal one from an old rival. The Huskers likely put themselves in position to give Redmond something to think about. There was 2019 prospect news that happened this weekend as well. Omaha Burke tight end Chris Hickman‍ was at the game and received a scholarship offer from Nebraska over the weekend. The rangy tight end (6-6, 195) is one of the top juniors in the state and his team is off to an undefeated start this year. I’ll have more on him later as I caught up with him late last night. One more visitor note before I move on to other recruiting news this weekend. There was a 2021 offensive line prospect on the sidelines for the Nebraska game. Hayden Conner‍ (6-5, 285) is a monster offensive lineman who is just a freshman. Nebraska is clearly wanting to get out in front on his recruitment. Nebraska already offered him back in June and Miami has also offered him. He will be a name to keep an eye on in the future. In other news, 4-star cornerback commit Mario Goodrich took an unofficial visit to Oklahoma State this weekend. I’m very high on Goodrich, and after seeing him play in person earlier this season I came away more convinced that Nebraska has a future big-time player on its hands. 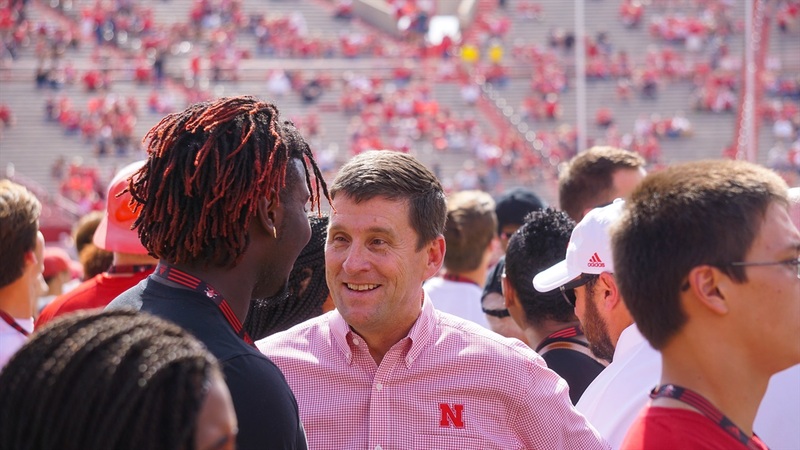 It’s not entirely surprising to see him take visits as he did say he would when he committed, but the timing with unrest in the Nebraska athletic department will make people wonder. I exchanged messages with Goodrich yesterday, and he says that it was just an unofficial and that he is still good with Nebraska. One of Nebraska’s best opportunities at landing an offensive tackle this cycle has been lost. Three-star offensive tackle, and No. 10 Greg’s Guy, Cade Beresford is a player out of Woodinville, Washington, that I am high on. He attended a Nebraska camp where he picked up an offer and really hit it off with the staff. Beresford had real interest in joining Nebraska’s class but for whatever reason it did not happen and Sunday night he verbally committed to Washington State. With Beresford off the board, I do not know if there are any tackle prospects with real interest in Nebraska but surprises happen in recruiting all the time. In more 2019 recruiting news, Nebraska is still in the mix for potential 5 star Brian Williams‍. The safety from Dallas, Texas, is from the same high school, Bishop Dunne that current Huskers defensive lineman Damion Daniels attended. Williams has been on campus before and will be one of the most sought after players in the 2019 cycle.